The 2017/2018 numbers are a “good news, bad news” story for U.S. enrollment professionals. The total number of international students in the U.S. topped one million for the third year in a row. In fact, this year’s total number surpassed 2016/2017’s total by 1.5%. International students contributed over $42 billion to the U.S. economy in the 2017/2018 academic year—not too shabby! Yes, the total number of international students in the U.S. has continued to rise. However, this rise is largely due to a growing number of existing students participating in the OPT program - especially with the STEM three-year extension available to some students. New enrollments actually dropped by 6.6% year-over-year. This is a big deal following last year's decline of roughly 3%. International competition is fiercer than ever. As Ben touched on during the Marketplace segment and we have covered here before, countries like Canada, Australia, and New Zealand are giving a hurting U.S. a run for its enrollment money. Their efforts to offer work experience and career opportunities to international students are far more welcoming than current U.S. policies and practices. Dropping enrollment has not had a uniform effect across the country. South Central states like Texas were hit much harder than the Northeast and California. Many universities throughout the country (especially top-tier universities) saw enrollment growth, not recession. National trends do not equal individual institution's experience. It's NOT all about top-tier ranking, though. Institutions paying attention to their internal admissions processes are winning (we're looking at you UMBC) . Take a look at the time it takes to process inquiries and applications and other barriers to entry for your international students. Streamline! It pays off. Institutions targeting their global market opportunities with clear messaging and creative approaches to recruitment content are doing just fine. (Tip of the hat to you, University of Cincinnati with all your multi-language brochures!). Taking a strategic approach to your marketing and spending the time (and resources) to do it well means that you stand out from the rest. Differentiation is how you win in a competitive market even when downward trends prevail. Causality is not as clear-cut as one may think. 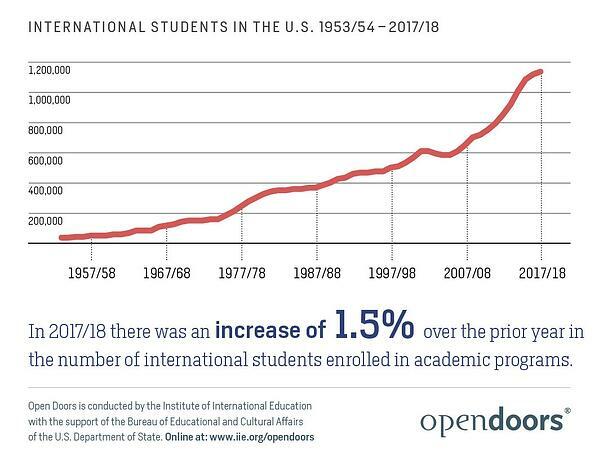 The market started to shift before Trump came into office: remember that the international student enrollment numbers actually began to flatten in 2015-2016. Some bits of this year’s data were surprising, too—for example, although Iran was included in Trump’s “travel ban” in January 2017, Iranian graduate enrollment actually saw a slight increase that fall. Would that increase have been even larger without the ban? Maybe! But it goes to show that nothing is simple about this many-faceted global market. We’d love to tell you that the “Trump effect” is not real, that enrollment numbers are soaring nationwide, and that now is a good time for your enrollment staff to sit back and relax. But the reality is that it is hard out there for those of us who care about bringing international students into the enriching communities we have to offer at U.S. universities. At least some of this trend is certainly due to the political environment in the U.S., if not all of it (see “the complicated news” above). And while the reasons are complex, the numbers are real and should not be ignored. And while many other news sources dance around whether or not this downward trend is due to Mr. Trump and his many outrageous statements...as we plan our targeted campaigns to recruit students, we cannot ignore the results of our Spring 2016 survey. As one example: Well before the 2016 election and after Mr. Trump referred to people from Mexico in ways that made us all cringe and wonder profoundly how this man's words could possibly resonate with others, our survey results showed that 80% of Mexican students were less likely to study in the U.S. if Donald Trump became president. Now, that's a big number and we know it represents a lot of annoyance (at least) with the rhetoric coming out of Washington. But, does it translate into actions? Well, yes: A net loss of about 1,400 Mexican students valued at roughly $42M in economic impact here in the US. Turns out, words and policies matter, a lot. The students are still out there—you just need to work a little harder to reach them. Yes, that is going to take an investment of time and resources. And yes, that means pressing your university leadership to put their money where their mouth is. Now is not the time to starve your admissions and marketing budgets of the fuel they need to succeed. 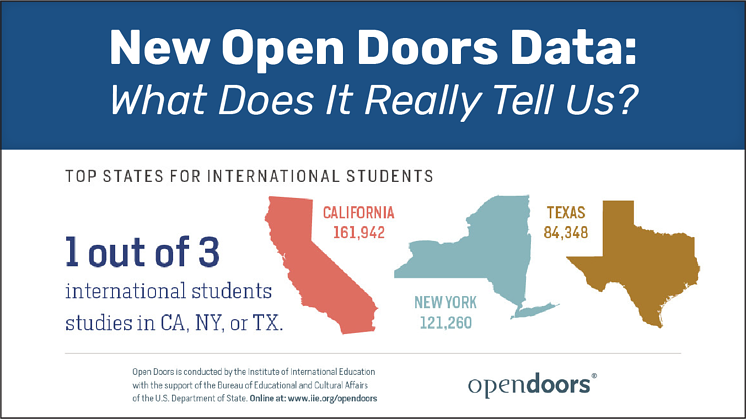 Bottom Line: You don't need to be top ranked or in California or Massachusetts to attract and enroll more international students. What you DO need is the staff, expertise and budget to make it happen. They won't simply walk in your door. That can't be a surprise to anyone...can it? Outside perspective and market data really can help convince leadership of the path forward. If you’re feeling a bit overwhelmed by the latest stats, please reach out. Whether you want to bring Intead in to help or just need a quick pep talk, we’ve got your back.